Phil Downs, manager of fleet services for Columbus City Schools, is pictured plugging in one of the district’s IC Bus hybrid school buses. Since 2006, Columbus City Schools has made significant progress in reducing emissions from its fleet of buses, installing new technologies and implementing a plan to replace 290 of its oldest buses. The district began working with Mid-Ohio Regional Council in addition to local environmental groups to figure out the best way to meet its green goals. The process involved not only purchasing new vehicles for the fleet, but retrofitting salvageable models and integrating new equipment as well. After rounds of application, several grants were awarded to the district, which helped pay for diesel oxidation catalysts, Zonar GPS, buses with clean-burning engines, buses with engine pre-heaters and hybrid-electric buses. In addition to reducing emissions, Downs says that going green has reduced the overall budget by $300,000, saving in parts and labor. The district’s buses are equipped with engine pre-heaters, which Downs says help to reduce idling and save on fuel. Becoming a more efficient facility is high on the priority list for Columbus City Schools’ transportation and fleet services department. Route efficiency is constantly improving with the district’s integration of GPS in its buses, which allows transportation supervisors to actively monitor unnecessary idling. Idling alerts from the GPS are automatically generated so the district can stay on top of its newly adopted vehicle idle time regulation. The regulation prohibits bus idling at schools and minimizes the amount of idling necessary in cold weather conditions. 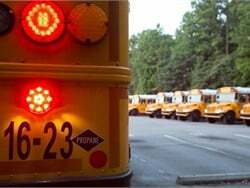 The regulation applies to district-owned school buses and vehicles, contracted school buses and non-district vehicles making deliveries to schools. Columbus’ fleet team has also strived to be more efficient in their everyday practices. Downs and his staff sample all buses’ oil on a regular basis, which allows them to extend oil changes up to 10,000 miles rather than 4,000 or 5,000. In 2009, Columbus City Schools’ transportation and fleet services department received the Mid-Ohio Regional Planning Commission Clean Air Award. The team was recognized for proactively installing pollution-reduction technology on more than 100 school buses and replacing more than 137 of the department’s older buses with cleaner ones, giving students a healthier commute. 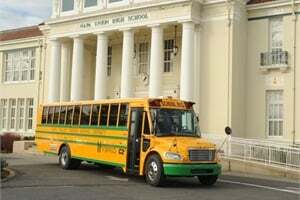 Now, in 2012, the department has replaced or retrofitted more than 290 buses, exceeding the district’s initial goal. Kellie Dean, president of Dean Transportation, talks about thecompany’s partnership with Greater Lansing Area Clean Cities. Five years ago, family-owned Dean Transportation made a commitment to minimize its carbon footprint by adopting green initiatives targeting idling, garage and office operations, power consumption and more. Since then, the company has reduced its environmental impact by approximately 10 percent each year. “We are investing heavily in emissions-reducing devices — diesel particulate filters and auxiliary power units/heaters. And, all of our new buses are using the diesel exhaust fluid,” says Patrick Dean, director of development for the company. 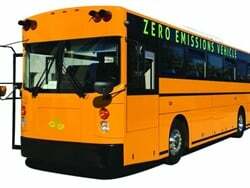 The company has also partnered with the EPA to retrofit all its pre-2004 bus models with diesel oxidation catalysts, which reduce pollution. All of its vehicles are equipped with Zonar GPS to track vehicle speed and idling. 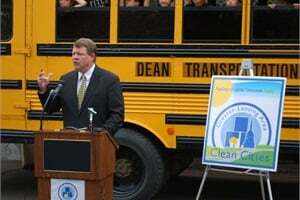 “We are also investigating the use of electric vehicles … and doing some research on propane and CNG buses,” Dean adds. 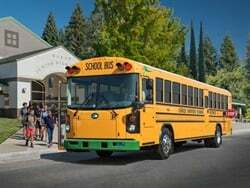 The company currently operates four hybrid-electric school buses (Thomas Built Buses C2es). Even more impressive, company headquarters and Dean Transportation’s West Michigan headquarters are both approved for their environmental efficiency and responsibility by the Society of Environmentally Responsible Facilities (SERF). SERF is currently reviewing the company’s new training and education facility in Lansing that was constructed using repurposed wood, as well as energy-efficient lighting and heating/cooling elements. But Dean says the company’s most important focus is on training. Moreover, the program includes training on managing special-needs students, responding to student health emergencies (such as allergy attacks and EpiPen use) and behavior management. Dean Transportation employees are encouraged to participate in the company’s community outreach efforts, such as volunteering at Michigan’s Special Olympics. And each fall, the company recognizes one of its drivers and one of its office locations for their commitment to the environment. Dean has also made his own efforts to cultivate a positive impact on the environment. In 2009, the Clean Cities Coalitions of Michigan gave Dean Transportation its Corporate Clean Transportation Leadership Award. While its green efforts are many, Dean says the company’s main focus will always be on student safety. 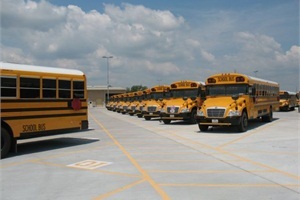 Dickinson ISD operates 28 propane-powered school buses and plans to add more to its fleet in the future. 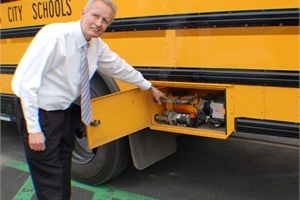 When Dickinson Independent School District’s (ISD) transportation staff moved into their new facility last August, they began one of their newest green initiatives: operating propane-powered school buses. Fleet Manager Ken Winters says 25 of the district’s 28 2012 Blue Bird propane buses were funded by Department of Energy and Texas Commission on Environmental Quality grants, and a refueling station was also secured through grant funding. “We’re going to keep adding to the fleet as the budget allows. Our goal is to have more than half of the fleet on propane,” Winters says. Propane use extends to the white fleet as well. Two trucks have been converted to run on the fuel, and vans will soon be converted. 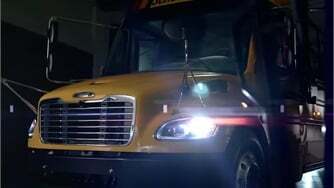 The operation’s 57 2005 and newer diesel-powered school buses are equipped with crankcase filters, and they are electronic fuel injected and feature EGR technology. Beyond the fleet, the new facility is on an energy management program. T5 high-bay lights, which Winters says are bright but have low amperage use, are used in the facility and the maintenance garage. Moreover, some of the parking lot lights operate on 50-percent power in the middle of the night, and the rest turn off. “We have a strict policy on not leaving any lights on in offices if you know you’re going to be out for more than five minutes, and all computers and monitors have to be turned off overnight,” Winters adds. The employees further reduce their carbon footprint by recycling glass, paper and plastic in an EcoRewards dumpster on-site. On the maintenance end, waste oil and antifreeze are recycled, and used tires are recapped. Tires that aren’t recapped are sold back to the manufacturer. Winters says they receive about $65 per casing, which goes toward the purchase of new tires. Increased fuel economy and emissions reduction are also important to the team. 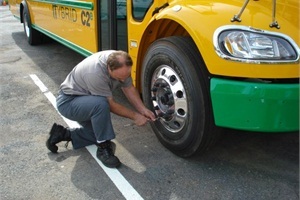 Tire air equalizers with sight indicators have been installed on the buses’ rear dual tires to help maintain proper tire pressure. Winters says this reduces the chances of running a tire low on air, which would damage it and affect fuel economy. He says the fuel savings from proper tire pressure is approximately 10 percent. If the technicians notice poor fuel economy in a bus and have ruled out a mechanical problem but notice that it has extensive brake wear, they share with drivers ways to not only improve buses’ fuel economy, but also to help increase the vehicles’ life through their driving habits. 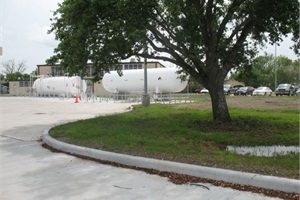 When the transportation department’s new facility was built last year, a propane refueling station was installed on site, and steps were taken to preserve the trees around the building. The techs recommend such practices as easing up on the throttle when approaching a stop, refraining from hard acceleration, and not hitting potholes and running over curbs. To reduce exhaust emissions, drivers are only permitted to idle their buses for up to three minutes. Routes have become more efficient through the use of GPS and routing software. 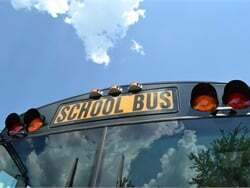 Winters says this has helped Dickinson ISD to reduce mileage, and there is an added safety benefit: The software helps create routes that require a minimal number of left-hand turns across traffic for school bus drivers. 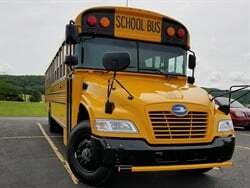 Houston ISD received grants for 27 propane buses and a fueling station. Here, Ramon Vazquez fills one of the buses with the alternative fuel. With its vehicles traveling more than 21 million miles each year, Houston Independent School District (ISD) has the potential to generate huge savings in the area of fuel use. Alternative fuels are a key part of the green undertaking. Last year, the district was awarded $2.5 million in grants for 27 propane-powered school buses and an 18,000-gallon fueling station. 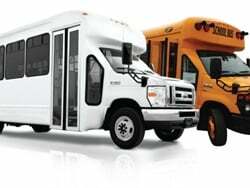 An additional 20 propane vans are on order, and a grant application has been submitted for 70 more propane buses. All of Houston ISD’s diesel-powered units run on a B5 blend of biodiesel. “That alone offsets our petroleum use by 105,000 gallons per year,” says Mark Swackhamer, senior manager of fleet operations. The district also recently brought its first hybrid vehicles into the fleet with a purchase of 12 units. An additional 16 hybrids are on order, two of which will be tested in the district’s police department. Swackhamer says that Houston ISD’s propane buses have reduced diesel usage by about 54,000 gallons per year. With propane’s lower fuel costs per mile, the result has been a savings of $74,900. Meantime, the district’s hybrid vehicles have cut fuel costs by $23,927. Reducing idling is another significant element of Houston ISD’s green transportation efforts. 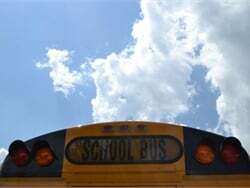 The district’s school buses, support fleet and police department vehicles are equipped with GPS/telematics, which “is used to track idle time, route efficiencies and on-time performance to schools and bus stops — along with dispatching and monitoring of service and safety personnel,” Swackhamer says. 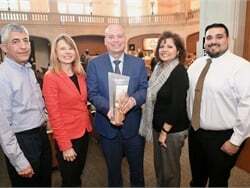 The transportation department at Houston ISD has gone green in a number of ways, from adopting alternative fuels to reducing idling to increasing efficiency. In November, Houston ISD launched an extensive no-idle campaign for its school buses, with daily reports and progress tables being sent to each school bus motor pool and to upper management. The reports track bus idle time in excess of five minutes for each bus and overall for each motor pool. “Drivers with excessive idle time were counseled, and overall idle time was reduced by 40 percent [or 8,556 hours] in a three-month period,” Swackhamer says, noting that this has equated to a decrease of 56 tons of greenhouse gases. The district has further decreased emissions by installing more than 490 particulate traps and closed crankcase ventilation filters on its buses. GPS has also been used with routing and scheduling software to cut the number of bus routes from 868 to 824 — while increasing ridership by more than 1,500 students. Correspondingly, 53 buses were taken out of the active fleet. Swackhamer says that the routing and fleet reductions have saved about $1.8 million in fuel, salaries and maintenance costs. Another green initiative at Houston ISD targets changing driver behavior. Using the GPS system, the district has developed a report that shows each time a vehicle has a “hard brake” event (with the threshold being nine feet per second). Initially, 20 vehicles were monitored without the drivers’ knowledge. Those who were found to be outside of the norm, in terms of miles between hard braking events, were notified. “I informed the driver that this was just an informational call and would hope that they would become more aware of their driving habits,” Swackhamer says. Most of the drivers who were contacted then shifted from an average of three miles between events to 10 miles between events. One driver went up to 27 miles between events. Napa Valley Unified School District recently took delivery of five Thomas Built Buses C2e hybrid school buses, one of which is pictured here in front of the district's headquarters. When it comes to green vehicles, Ralph Knight is undeniably an early adopter. 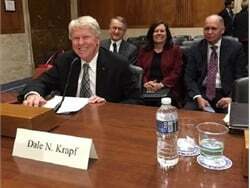 As the transportation director for Napa Valley Unified School District, Knight has pushed his colleagues toward alternative options since the first electric bus was available in California in the late 1990s. Under Knight’s supervision, the Napa Valley school district eventually replaced close to $10 million worth of equipment using grant money. Napa Valley continues to expand, fostering a substantial green fleet with everything from hybrid buses to an all-electric bus, which the district plans to purchase. According to Knight, the incorporation of alternatively fueled vehicles has saved the district millions of dollars. His motto is to focus on the long-term benefits rather than a vehicle’s initial cost. He also reports to be saving in other areas as well. Maintenance is often cheaper because newer buses have more modern systems, and their fuel efficiency also reduces the overall need for oil changes, for example. He has always been eager to get his hands on the latest equipment, and this trait serves the entire school district well. In addition to assisting students, these hybrid buses are now used for other district affairs, such as transporting people to and from conferences. As part of his daily routine, Equipment Service Technician Mike Smith checks the tire pressure on a C2e. Knight has worked in transportation for as long as he can remember. He started at the age of 18, working in Napa Valley as a bus driver. Then, after immersing himself in the industry, he became transportation director in 1996. He has seen his department grow and attributes a lot of its success to his largely green fleet. “There’s no way to run a transportation department any cheaper both in cost of fuel and cost of maintenance/repair,” Knight says. To read the last edition of Green Fleets Across America, go here. What if there is a green product that may increase your sustainability and your bottom line ??? How much may you benefit ?? ?